How do I back up my private key in IIS 5? Unique, Domain wide 'Floating' logo - doesn't interfere with your site design!! Scrollbar independent - the page moves, TrustLogo stays!! Gone are the days when you had to re-arrange your webpage to accommodate a third party logo. TrustLogo's floating design means it exists outside of your page design and can easily be implemented across your entire domain. Just add a little java script to each page and you're away!! TrustLogo remains in place when a visitor scrolls your webpage. No flickering, No movement, No distraction. See for yourself by scrolling this page!! TrustLogo™ removes a major barrier to successful e-commerce: the lack of the ability to verify the trust between a website and its visitors. Just hover your mouse over the TrustLogo at the bottom of this page. You’ll see our example credentials served up in real-time directly from IdAuthority (Trusted Third Party) for up to the second validity! 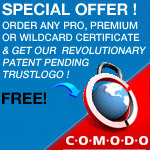 Prior to being issued with a seal, your details are validated by Comodo, the trusted third party. TrustLogo delivers trust, confidence and peace of mind to your customers and brings you a unique feedback facility so that you can see how many of your customers need to verify your identity every day. The ‘Corner of Trust’ will standardize the way people view your trust credentials. The end result? You’ll convert more website visitors into paying customers.